Perspective of the Dr. John Dreyfus House, Quincy, Mass., 1954. Royal Barry Wills, Architect. With support from a $150,000 Museums for America Grant from the Institute of Museum and Library Services (IMLS), Historic New England is cataloguing and digitizing the Royal Barry Wills Associates Archive. Royal Barry Wills achieved these distinctions through his talent for design, brilliant marketing skills, prodigious work ethic, and clear understanding of his clients’ desires. After founding his firm in 1925, Wills went on to design 2,500 single-family residences across the country, many in the Cape Cod style; write eight books about architecture; host a radio program; lecture widely; receive numerous awards; supply “Home Building Plans” for a number of newspapers; and become the subject of feature articles in Life, The Saturday Evening Post, and Good Housekeeping. 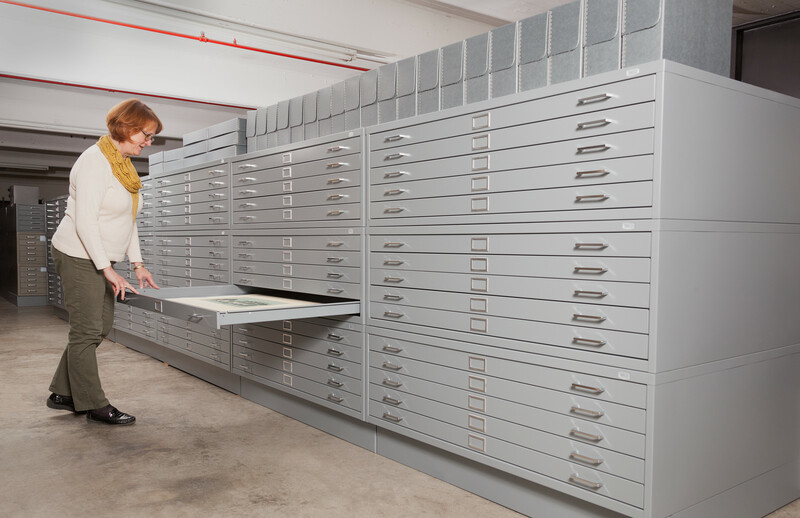 Lynne Paschetag examines new Royal Barry Wills flat files at Historic New England’s Haverhill Facility. Following Wills’s death in 1962, the firm, under his son Richard Wills, Merton S. Barrows, Robert E. Minot, and Warren J. Rhoter, continued designing houses and other structures throughout the United States that were based on the design principles expounded by Royal Barry Wills. In 2013 Royal Barry Wills Associates donated its archival holdings to Historic New England. The collection contains materials from the 1920s to 2003 and includes architectural drawings for 2,000 projects (32,000 individual items); 6,000 black-and-white and color photographs; 800 8″ x 10″ negatives; 74 linear feet of project files; and 27.5 linear feet of scrapbooks, publicity files, original manuscripts and accompanying illustrations, reference resources, miscellaneous photographic materials, recordings, speech scripts, certificates, and diplomas. In the fall of 2016, Historic New England secured a $150,000 Museums for America grant from the Institute of Museum and Library Services (IMLS) to support a two-year project to catalogue, clean, rehouse, digitize, and provide online access to the Royal Barry Wills Associates Archive. To date, the project staff has developed a comprehensive work plan; installed eighteen new five-drawer archival flat files to hold the collections; purchased numerous archival supplies, including map folders, file folders, storage cartons, buffered paper, gloves, and slide and negative sleeves; arranged and described twelve unique scrapbooks that document the work of the firm from 1926 to 1972; begun to process Royal Barry Wills’s original manuscripts and illustrations his books; and photographed 780 items. The IMLS grant will enable us to illustrate the firm’s many projects through digitization (a total of 11,000 items will be photographed), expand access to the collection to the broadest public, and increase awareness of the Wills firm’s extraordinary influence on domestic architecture in America. 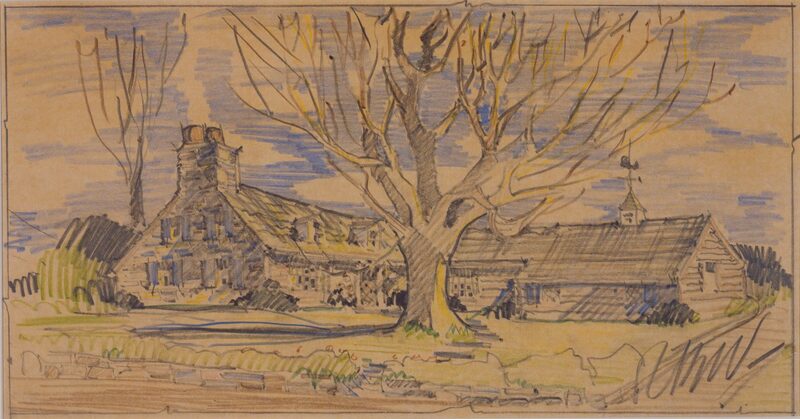 In the meantime, explore our Collections Access database to see more of the thousands of architectural drawings and related items preserved by Historic New England.